AFHJ Architects, the oldest active architecture firm in Fayetteville, has joined with Bentonville-based Harrison French & Associates (HFA), the largest architecture and engineering firm in Northwest Arkansas, according to a news release. As part of the move, Laleh Amirmoez, the sole member of AFHJ Architects, has become director of design for Northwest Arkansas at HFA, “which diversifies HFA’s experience while solidifying its dedication to serving local clients,” the release shows. Chris Horton, executive vice president and CFO for HFA, explained Amirmoez was “joining forces” with HFA, and the move was not an acquisition. Amirmoez started in September. The move will also expand HFA’s footprint to include a Fayetteville office at 100 W. Center St., which was formerly the office of AFHJ Architects. Amirmoez will work at HFA’s Fayetteville and Bentonville offices. When asked if AFHJ Architects will cease to exist, Horton said “at some juncture. We’re in no hurry for that to go away.” But the name will no longer be included in marketing. AFHJ Architects was established in 1973 as Hailey and Associates. 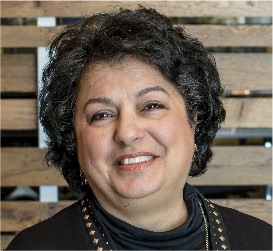 Amirmoez joined the firm after she graduated from the University of Arkansas in 1984 and became partner in 1992. With over 30 years of experience, Amirmoez “brings a variety of experience in commercial, residential, educational, civic, faith-based and retail architecture to HFA,” according to the release. Some of AFHJ’s projects included 5 West Mountain in Fayetteville, Bentonville Public Library, renovation of Washington County Courthouse, Spring Street Parking Garage and several churches and homes. Harrison French, founder and CEO of HFA, and Amirmoez previously worked and attended school together. Including the Fayetteville office, HFA has offices in Bentonville, Boston, Fort Worth, Texas, and Mexico City. The firm reported 184 employees earlier this year.